Two Dragon Force 65 yachts engaged on a beam reach. If you like to start from the basics of sailing, here you approach how to trim the sails of your rc yacht while steering. Since we focus on radio sailing, see also this previous post to deepen how to control the sails and the rudder using the two joysticks of the radio unit. Precise and timely trimming the sails will make your boat move at the speed you need: it will be easier to steer and your sailboat will race faster. The mainsail and the jib are the “engine” of your boat: thanks to the action of the wind, they act as wings to “produce” power to move the hull. As wings, the sails have shapes with curved sections. The wind flows at different speeds over both sides of the sail, creating a depression that “pulls” the boat forward. During a close hauled point of sail, the forces that are generated act as a “lift” that moves the hull upwind. Otherwise, when sailing downwind the wind pushes against the sails from behind and simply shoves the boat forward. Doyle Sailmakers' Team has created a Star upwind simulation that shows the air stream flow over the sails and their differences in speed. Sail trimming is critical for your boat speed. A sailboat can’t move if the sails are loose and flapping in the wind. As soon as they are tightened up, the boat is starting to move forward. Trimming is to move the angle of the sails so that they catch the wind with the maximum efficiency. First, you must constantly be aware of the wind direction. Second you start to position the angle of the sails and to trim them accordingly. A basic criteria to properly trim the sails, no matter what course your radio yacht is sailing, is to ease the sails out until they begin to luff. Next, pull them in until the luffing stops. In order to maintain the sails effective, you must keep a smooth air flow over both sides of the sail with no luffing. Anyway, by practicing it will be “automatic” to know how to set the sails in relation of the direction of the wind. Any “point of sail” that your boat is keeping involves an appropriate position of the sails. Even if your boat cannot sail pointing directly into the wind direction (in the no-go zone, the sail will luff, or flap like a flag in the breeze), it will be easy to properly set the sails when the hull is at an angle greater than 35/45 degrees from the wind. 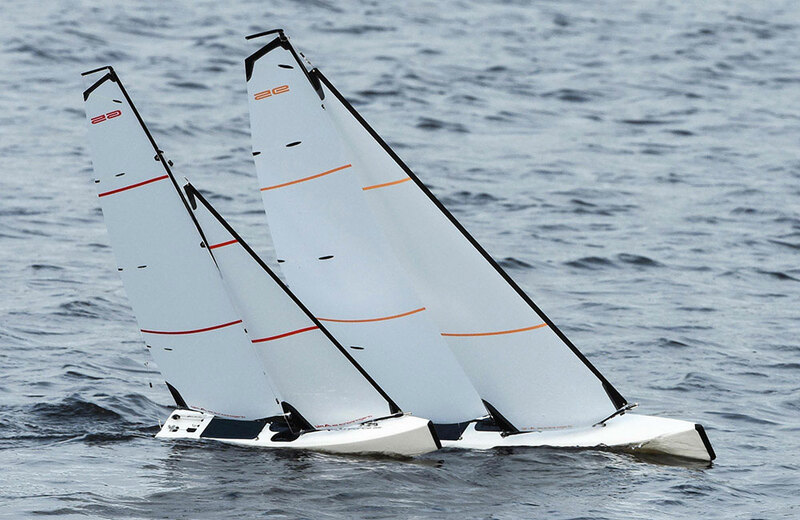 RC sailboats above: sails are trimmed to beating upwind. On a close-hauled course the sails are “in tight” (at only a slight angle to the center line of the hull). RC sailboat above: sails are trimmed to running downwind. On a run (sailing away from the wind), the sails should be all the way out: you need them to be perpendicular to the direction of the wind to expose the maximum amount of sails area, ideally by keeping the booms quite perpendicular to the center line of the hull. RC sailboats above: sails are trimmed to a reach. Reaching, or sailing roughly perpendicular to the wind direction, has a sail position about halfway between close-hauled and a run. If you change direction or point of sail or if it’s the wind direction that shifts, you must properly re-trim the position of the sails all the time.